Let There Be Light Photography: Miami Food Trucks - Hollywood, FL - Arts Park at Young Circle every Monday! 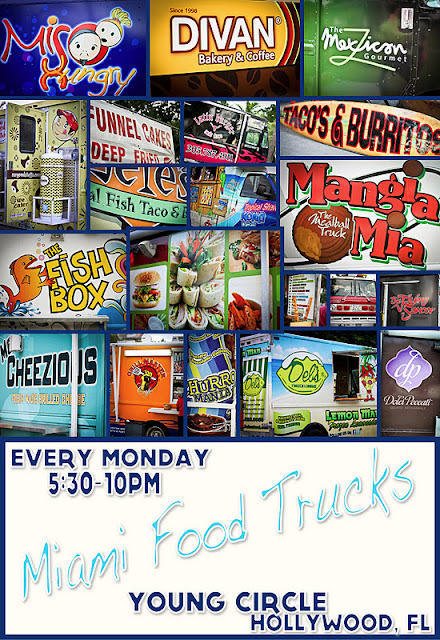 Miami Food Trucks - Hollywood, FL - Arts Park at Young Circle every Monday! Hope everyone had a lovely Thanksgiving. In honor or eating delicious food, here is a little photo-montage dedicated to the Miami Food Trucks that visit our sweet City of Hollywood every week! I stopped by recently with some out-of-town visitors and enjoyed some of the delicious cuisine. It's hard not to indulge in at least SOMETHING. But if you are in Hollywood, FL and are anywhere near dowtown Hollywood on a Monday night, you should swing by and check out some of the food trucks. If not to eat, than at least to browse! You can find them starting at 5:30pm (probably earlier too) in Arts Park at Young Circle.